Food Blogga: Mini Muffins Are Huge. Americans love all things mini. There are Mini Coopers, mini burgers, mini skirts, mini appliances, mini fragrances, and with the dismal economy, even mini-vacations (which is a euphemism for staying home and renting movies). Next time you're at the supermarket, take note of how many mini items are available: There are mini water bottles, mini yogurts, mini candy bars, mini buns, and the list goes on. Good luck escaping the ubiquitous mini "100 calorie" snack packs. So what makes mini so big? My theory is the cuteness factor. I mean, come on, can you get much cuter than a Mini Cooper? And no one would deny that a mini tartlette is cuter than a large one. And think about the first time you saw a mini lipstick tube. You probably said, "Oh, it's so cute!" There's also a common belief that mini foods are better for you. With portion control built it, most people feel like they're consuming fewer calories and being healthier. Of course, as marketers and most of us already know, that doesn't always work so well. The reality for many of us is that mini sized foods often translates to: Great! Now I can eat more of them! There was even a study published in The Journal of Consumer Research that showed people tend to consume more food that is packaged in mini sizes since they view it as diet food, and consume less food in traditional large packages because they're concerned about overeating. So today I've got some Low-Fat Banana, Cranberry, and Honey Mini Muffins, which really are cute and healthy (provided you don't eat six of them in one sitting). 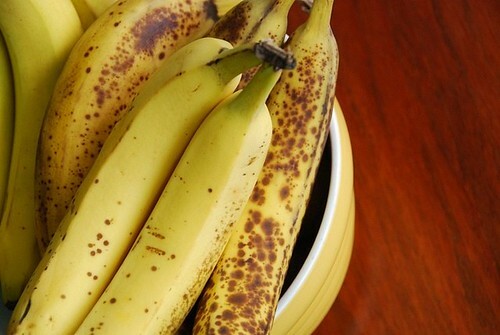 This is also the third recipe in my series on how to use up ripe bananas. Check out the first and second recipes too: Mini Banana Bundt Cakes with Sticky Maple Syrup Glaze and Banana, Oatmeal, and Raisin Cookies. Plus I'll have a final banana recipe next week. Here's to thinking big by going mini. By using half whole wheat flour and mostly egg whites, the fat and cholesterol in these muffins is reduced, while the fiber is increased. 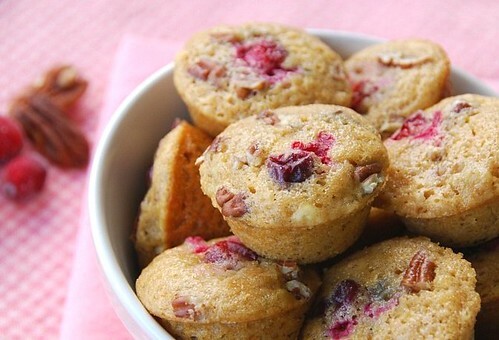 Plus antioxidant-rich cranberries and high potassium bananas make these muffins subtly sweet and tangy. Place rack in center of oven, and preheat to 375 degrees F. Spray muffin pan with cooking spray. Combine flours, baking powder, baking soda, salt, and cinnamon in a large bowl and stir well. In a medium bowl, combine brown sugar, honey, vanilla, Smart Balance, and eggs; beat with an electric mixer on medium speed until smooth. Add the bananas and orange zest and lightly beat until blended (it's okay if it's a little bumpy from the bananas). Add to the flour mixture, mixing on medium-low speed until just combined. Avoid over mixing the batter as it will become heavy. Using a rubber spatula, fold in the cranberries and pecans. YUM! I have a bunch of fresh cranberries just waiting to be used - I just didn't know this is what they'd be used in. Can't wait to try it! They are really cute! :) I love mini things because I hate biting into something big and getting crumbs, icing, whathaveyou all over myself. The great thing about mini is that you can have seconds without looking like a pig. These muffins are adorable, and v. tasty too! I love all of the flavors in these minis! As it is mini i will have to have atleast 4 of them as they look so delicious. Yes, exactly. Mini equal cute. That's what makes mini things so popular! Ahem. Those honey muffins are sooooooooo *cute*! Funny, Americans do love mini things. And then we love supersized things. What about loving normal sized things...! So cute! :) I'm trying to imagine what cranberries and banana tastes like. Hmmm, can't do it... guess I'll have to toss some cranberries in next time I make banana bread! 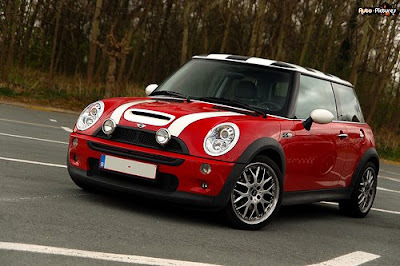 Yes we love mini. They are so cute. Even mini-cupcakes. But it's hard to stop at one. As a child who spent way too much time playing with her dollhouse, a love of all things mini and cute is part of me for life. And now, I'm adding these sweet muffins to the list of things I love! LOL! I could easily eat 6 of these!...love the flavour combination Susan. You make the healthiest muffins! I've bookmarked this one. Can't wait to make it. Those look so cute. Thanks for sharing a low fat recipe. I can use it right about now. You have to listen to Jim Gaffigan's bit on mini-muffins. Then I think you will understand the popularity of the mini-muffin. mini is always cute . these are ideal as a nice small treat problem is how many of these I will gobble in one sitting :) ups! thanks for sharing this yummy recipe . Such an interesting perspective, Susan. I was reminded by the time I parked my Ford Festiva (a mini car, I guess), next to a Cadillac, twice as long plus some more. The driver, a nice elderly lady, got off her car, looked at mine and exclaimed: "How..., how..., how cute!" Your mini-muffins look great. One of the best investments I've ever made was buying myself a Mini Muffin Pan from Target! I'm pretty sure I use it about twice as much as I use my normal-sized muffin pan. 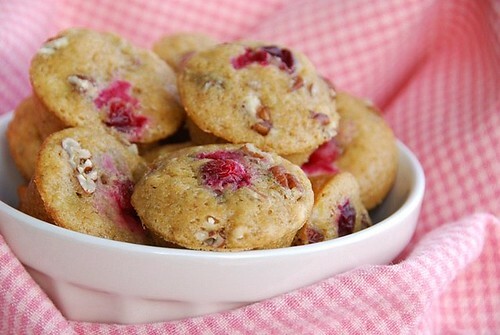 Your mini muffins are SO cute and how can you go wrong with cranberries pecans? I LOVE the fact that you used fresh/frozen cranberries instead of the dried ones cuz I can NEVER find any good recipes using those! 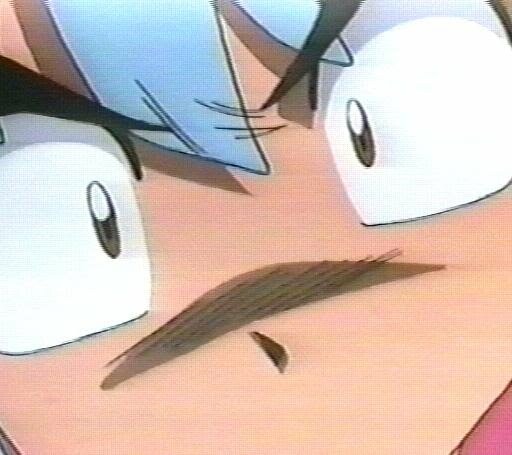 Now how could I eat just six of those lil' beauties? Anyway, your muffins are BIG in flavor and nutrients! I love mini muffins -- they are the ultimate in portion control. I use my mini pans for both sweet muffins and mini quiches. It's true, all mini stuff is cute, and muffins are of course one of those things! These look simply delicious, and... I love cranberries! Oh my! These muffins seem so tempting! I love fruity/chunky muffins and cakes. And cranberries are great in this recipe. They look wonderful and I'd love to eat two or even three of them *blush* greedy me!! Your muffins sound and look delicious! I don't know why but I love mini-muffins and cupcakes. These sound really good! I think I have all of the ingredients for these but I don't have mini muffin tins. I'm sure they'd work just as well though if I made regular sized muffins! And mini cupcakes! I make those and like them best because I can't handle a bunch of sweetness, but one bite is just right. Those muffins are so cute. I love the dark pink color! Gosh, they are cute! Susan, you are the muffin queen! I can so relate to the "mini" culture. When I went on a diet I got bags of mini chocolates with the thought of having 1 a day. Knowing what I'm like I asked my husband to hide the bags from me before I scoff everything down at once. So during happy hour I get my choc every day, but it is so darned small! Is this it?!?! Grrrr....want more. These look so good! Thanks for the recipe. I love mini anything! Makes me feel kinds virtuous! So cute these muffins! The flavor of all this ingredients together sounds delicious! I like mini food stuff because I can somehow trick myself into thinking that I'm eating less. In reality I'm probably eating more because they're easier to pop in your mouth.